On October 15, 2018, Charge d'Affaires a.i. 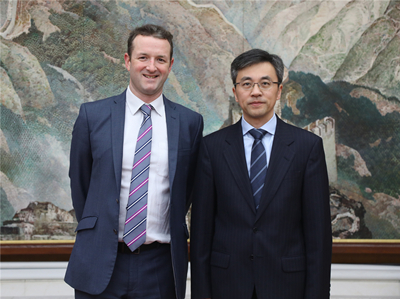 Zhu Qin met at the Chinese Embassy with Jamie Angus, Director of BBC World Service Group. Ms Zeng Rong, Minister Counsellor for Press and Public Affairs of the Chinese Embassy was present. Zhu noted that BBC is an important international media. China attaches great importance to maintaining a sound cooperative relationship with BBC. This year marks the 40th anniversary of China’s reform and opening up. China will continue to deepen its reform and opening up, while stay committed to mutually beneficial cooperation with other countries in the world. He hoped that BBC would report on China in a fair, balanced and professional manner to present a comprehensive and objective picture of China’s development in various fields and show a real China to the world. Angus said that China’s remarkable development has brought various opportunities to China-UK cooperation. BBC attaches great importance to reporting on China and is willing to strengthen communication with the Chinese Embassy to have a comprehensive coverage on China’s development and China’s foreign and domestic policies and help enhance a better understanding of China in the world. The two sides also exchanged views on issues including China-US relations, China-US trade dispute, China-UK relations in the context of Brexit and internet security.